Entrepreneurship allows one to create value with their strengths. Udhyam focuses on this aspect of self-discovery and creating self-reliance through grassroots entrepreneurship opportunities. Through Udhyam Shiksha Program, we focus on helping young people develop entrepreneurial thinking, have finance and digital literacy and build strong non-cognitive skills. We work with the age group of 16-25 through various schools, colleges, and other non-profit organizations. We focus on helping young people develop life skills like grit, confidence, creativity, openness, problem-solving, experimentation, teamwork and communication. 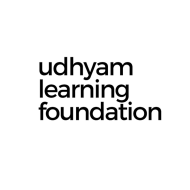 Udhyam conducts classes in Entrepreneurship Training. It is located in Koramangala, Bangalore. It takes Regular Classes- at the Institute.